The majority of hiring and placement decisions are made by managers or executives who have "gut feelings" about people. Yet, often those placements lead to impulse hiring, unforeseen training costs, and high turnover rates. What is the solution? Job matching. Job matching is basically common sense combined with objective assessment data. Common sense plays a role because you would not put a social, high-energy person behind a desk as a data entry clerk. In the same way, you would not ask an introverted, number cruncher to be an event planner. Too often, employers hire based only on work experience, education, and qualifications. Why aren’t personality and internal motivation considered? That is the role that objective assessment data plays. "Appropriate job fit is essential for employees and managers to be high achievers." By using assessment tools, you can measure a person’s personality, behaviour, learning style, and interests. If you combine this information with a person's resume, then you have a more comprehensive picture of the candidate. People often take jobs because they need a job - not because they like to do the job. Most people are capable and resilient enough to learn how to do many jobs, but they probably prefer only certain types of jobs. High turnover is the result of people taking jobs that are not a good match for them. Retention is achievable when qualified people are matched with jobs that fit who they are as a person. All companies should have multiple job match patterns. Patterns are typically developed by evaluating the results of top-performing employees in a particular position. For example, you may have a sales team that has three successful sales people. Job patterns are created by averaging the scores of those top performers. This will enable you to create a job pattern for that particular job. Then when you assess applicants, you will be given an auto-generated report that states how closely the candidate’s characteristics match your top performers. If the candidate has a high percentage, they are likely to do well in a sales position. If they are a low job match, they may struggle to be successful. This does not mean that the person with a low percentage will make a bad employee; it means that the candidate is better suited for a different type of job. The PROFILE XT® measures learning style, behavioural tendencies, and occupational interests. After the candidate takes the assessment, a job match percentage is generated. You will immediately know if a candidate has the potential to succeed in the position you are trying to fill. PROFILE XT® assessments are customizable to develop job match patterns by company, position, manager, or geography. Managers across the board encounter difficult selection and organization decisions. Assessments are a tool that can be used to clarify and solidify placement decisions. 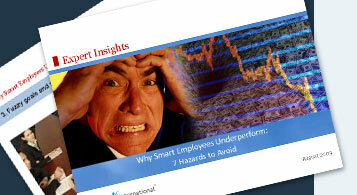 They provide the best possible insight for those seeking deeper information about employees. Assessments can be used in both the hiring or development processes. Maybe you already hired the wrong person for a particular job. How do you remedy the situation? You do exactly what you would do with a new hire — have your employee take the assessments and then you place the assessment results next to the resume. Then you will have two options: You can use the coaching and development reports to help that employee be the best he can be in a position that doesn’t completely suit him. Or, you can identify a new opportunity for the employee and transfer him to a position in which he is able to excel. Job matching is not only objective, it is also efficient. Job matching will help you hire the best person for a particular job. Appropriate job-fit is essential for employees to succeed and companies to be productive.